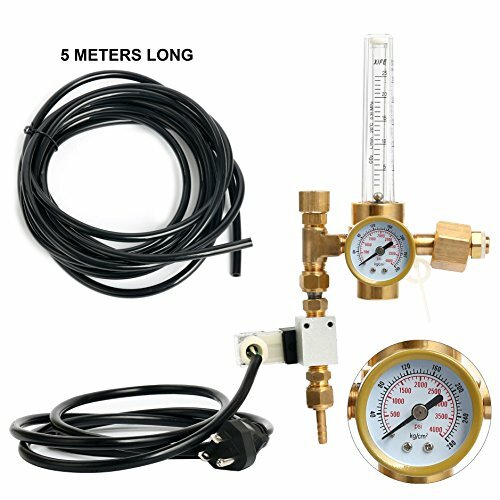 - BRASS CONSTRUCTION: Long-Lasting Dependability and Durability a Well as Combines a Precision Regulator, Flow Gauge, and Industrial Solenoid Valve. - DESIGNED FOR INDOOR GARDENING GROW ROOMS AND GREEN HOUSES. To Enhance Carbon Dioxide to the Growing Environment this CO2 Regulator Will Allow you to Maintain Ideal CO2 Levels for Optimum Growth. Or it can Help you get you a Nice Refreshing Cold One Straight From the Tap. - ALSO DESIGNED FOR KEG AND KEGGING & Anything Else That Requires a CO2 Regulator,Such as Soda Fountains, Etc...INCREASE THE PLANT METABOLIC RATE: Speed up Growth Rates and Yields by up to 40%. - 110 VOLTS U.S. STANDARD U.S.A. POWER. - Plastic Tubing is 5 Meter Long. BRASS CONSTRUCTION: Long-Lasting Dependability and Durability a Well as Combines a Precision Regulator, Flow Gauge, and Industrial Solenoid Valve. DESIGNED FOR INDOOR GARDENING GROW ROOMS AND GREEN HOUSES. To Enhance Carbon Dioxide to the Growing Environment this CO2 Regulator Will Allow you to Maintain Ideal CO2 Levels for Optimum Growth. Or it can Help you get you a Nice Refreshing Cold One Straight From the Tap. 110 VOLTS U.S. STANDARD U.S.A. POWER. Plastic Tubing is 5 Meter Long.